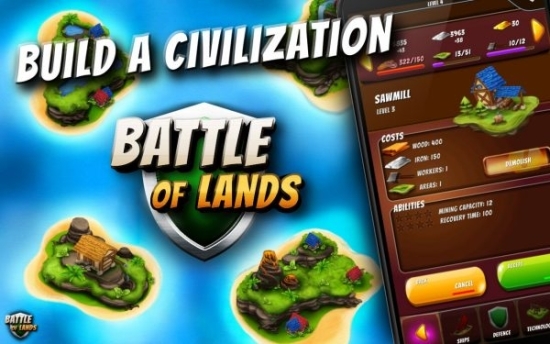 Immerse yourself in a mortal war of clans! Build and battle your way to glory. 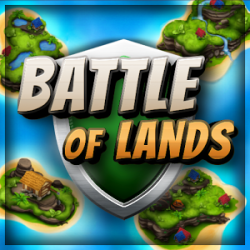 Battle of Lands is real-time strategy game with interesting unique features, missions and units. Lead your people and build an unrivaled empire! ☆ FARMS – FARMS PROVIDES FOOD. EVERY SHIP AND DEFENCE UNIT REQUIRES FOOD. ☆ SAWMILL – SAWMILL PROVIDES WOOD RESOURCES. ☆ IRON MINE – IRON MINING PROVIDES IRON MINERALS. ☆ GOLD MINE – GOLD MINES PROVIDE MINING OF GOLD MINERALS. ☆ SHIP YARD – PROVIDES THE ABILITY TO BUY SHIPS. EVERY LEVEL PROVIDES INCREASED BUILDING SPEED OF UNITS. ☆ DEFENCE COMMAND – PROVIDES THE ABILITY TO BUY DEFENSES. EVERY LEVEL INCREASES BUILDING SPEED OF UNITS. ☆ LABORATORY – RESEARCH AND DEVELOP TECHNOLOGY. PROVIDES THE ABILITY TO BUY TECHNOLOGY. EVERY LEVEL PROVIDES INCREASED BUILDING SPEED OF UNITS. ☆ TRANSPORTER – IT TRANSPORTS MINERALS BETWEEN ISLANDS. ☆ COLONIZER – IT COLONIZES AN EMPTY ISLAND WHICH ALLOWS YOU TO BUILD BUILDINGS. ☆ BATTLE BOAT – LIGHT AND VERY FAST BOAT. IT CAN PERFORM QUICK ATTACKS. ☆ FIRE SHIP – MEDIUM CLASS SHIP. TRANSFORMATION ABILITY INCREASES CANNON POWER. ☆ MORTAR – MORTAR HAS THE ABILITY TO DESTROY BUILDINGS AND DEFENCE FROM DISTANCE. ☆ GALLEON – AN IMPERATOR CLASS SHIP DESIGNED FOR EXTREME COMBAT. HEAVIEST ARMOR AND FORMIDABLE SPEED. PROVIDES INCREASED DEFENSE SHIELDING TO SURROUNDING SHIPS. ☆ IMPERIAL FRIGATE – MOST POWERFUL UNIT WITH THE ABILITY TO CHANGE DESTINATION DURING SAILING. TORPEDO ALLOWS IT TO DESTROY SEVERAL SHIPS PARALLEL TO EACH OTHER. 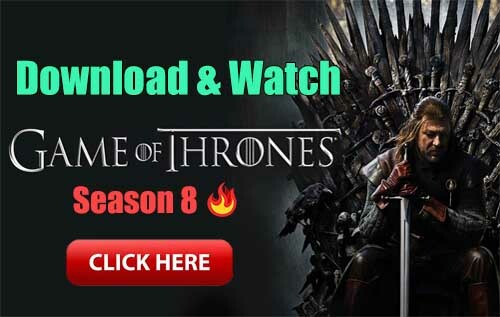 ☆ ARCHER – ARCHER IS A WEAK SHORT DISTANCE DEFENCE UNIT. ☆ BALLISTA – BALLISTA IS A WEAK LONG DISTANCE DEFENCE OPTION. ☆ CANNON – CANNON IS BIG STRONG DEFENCE UNIT. ☆ GREAT CANNON – GREAT CANNON CAN DESTROY SEVERAL SHIPS IN PARALLEL. ☆ MINING STATION – MINING STATION ALLOWS YOU TO MINE MINERALS FROM SMALL ISLANDS. SEND IT TO AN ISLANDS AND CHOOSE WHICH MINERAL TO MINE. ☆ DEFENCE STATION – IT HAS LONG DISTANCE WEAPON TO MAINTAIN ORDER ON SEA. SEND IT INTO SEA. ☆ MERCHANT STATION – MERCHANT STATION PROVIDES THE ABILITY TO TRADE MINERALS. SEND MINERALS BY TRANSPORTERS TO STATION TO START EXCHANGING MINERALS. ☆ KAMIKAZE SHIP – IT CAN DESTROY ENEMY BUILDINGS AND DEFENCE UNITS ON A ISLAND. ☆ FIRE CATAPULT – IT IS A OFFENSE/DEFENCE OPTION. USE IT WHEN ENEMY SHIPS ARE NEAR TO DEAL DAMAGE. ☆ CAMOUFLAGE – MAKES PLAYER’S SHIPS INVISIBLE. ☆ FORTIFICATION – TEMPORARY FORTIFICATION ALL OVER THE ISLAND. IT CAN DEFEND FROM EXPLOSIVE SHIP, MORTAR SHIP ATTACK AND ENEMY SHIPS INVASION.